We got up this morning at about 3:45-4:00am. I got ready (a girl has to look pretty, right?! ), and we headed out to get the airport bus at 5:10am. We ended up having 4 rolling suitcases and three backpacks between the two of us. We were really worried last night about the number of suitcases we were allowed, the weight maximums, and the checked baggage size allowance. I think we repacked half a dozen times. When we got to the airport, it was pretty busy for 6:30am. We found our check-in desk and approached the desk with a smile. Can’t hurt to schmooze the person who has the fate of our luggage in his hands! I mentioned to him that I saw on the website that for flights to Europe, there is no official baggage number, but two or fewer is recommended. He told us no problem, so we loaded up 5 bags between the two of us. At that point, we left the desk and no more than 2.5 seconds later did Romeo remember an important document that was in his just-checked luggage, which had literally just left the conveyor belt. We hummed and hawed over if we should attempt to retrieve it, but ultimately decided that we would risk it at security (the document states he is allowed to have the medicine he is carrying with him). If security wouldn’t let it fly, we would have to run back to the check-in counter and try to find our bags, dig out the paper, then go back through security and try to make our flight. We were feeling a little scared at this prospect, so we booked it to security. I mentioned about changing currency when we saw the banks, but we decided security was too much to risk to take the time now. We got through security without instance. They stopped Romeo’s bag with the meds, but they were more concerned about an icepack than the medicine. When we got through that, we had to take a train to the concourse. This took some time, plus a desperate need for a tea latte and some breakfast warranted a stop at the Coffee Bean & Tea Leaf (my favorite coffee place in Seoul). We grabbed a bite then headed to our gate. Since I didn’t see any more banks, we decided to change money in Shanghai (cue the foreboding music). We boarded the flight, and had a pleasant two hours in the air. 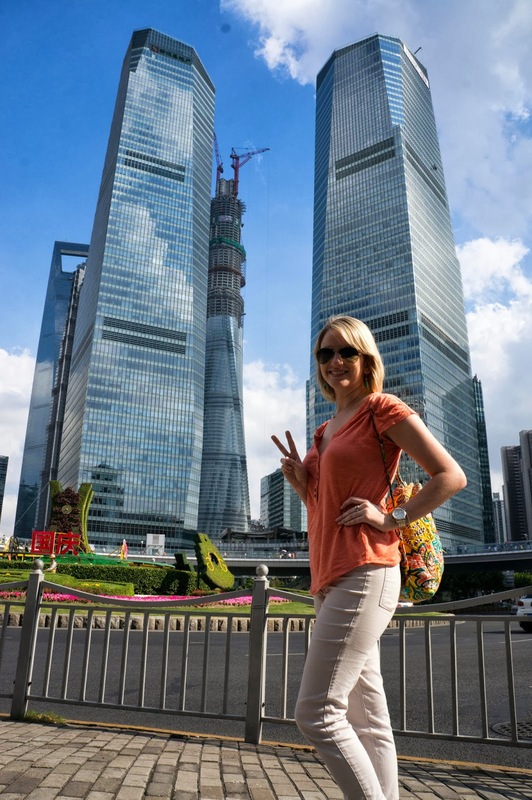 We had been a little nervous about flying China Eastern, as we had heard from my coworker about a bad experience she had had with them, but it was actually enjoyable. In the two hour flight, we got a meal and two drink services. Both of us knocked out, myself before we even took off the ground! (Of course, the takeoff woke me back up temporarily). 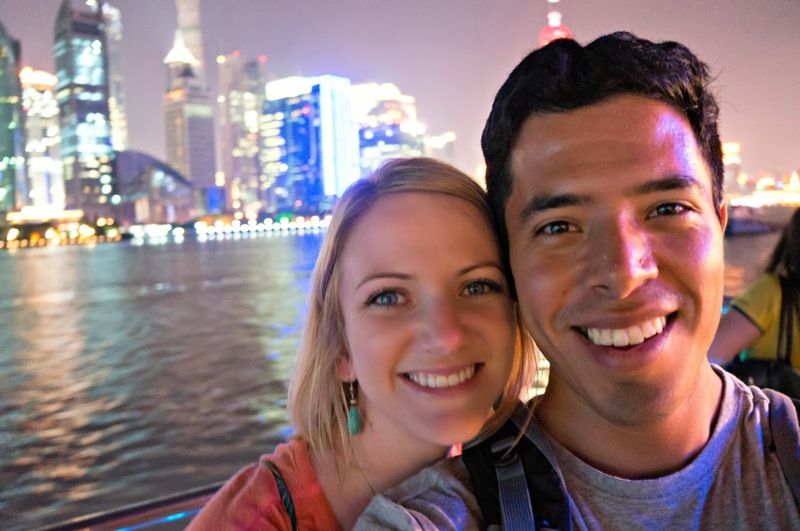 When we landed in Shanghai, we went through customs and had to get a special stamp in our passports that said we were allowed to be here for only 1 day (since we are only here for a layover, we are allowed to go into the city without a visa, but only temporarily). Once that was completed, we looked for a place to convert some money. We found one place before going into the arrivals gate, but I suggested we wait and try at a bank branch (my experience in Beijing taught me that banks are a much better place to convert currency). Well, we never found a very good deal and ended up having to pay a commission. Super bummer, but Romeo’s cool-calm-and-collected approached leveled me out. I wanted to try to find a way into the city and find a bank there that wouldn’t have commission fees, and all this jazz, but he reminded me that in the long run it’s really not that much, and if it allows us more time to enjoy the city by just sucking it up and paying, it was worth it. So, fee paid and cash in hand. Once that was completed, we checked our big backpack for the day so we wouldn’t have to carry it around and then headed to the Maglev high-speed train. It is the fastest passenger train in the world! We got round-trip tickets and then headed for the city! On the Maglev high speed train. The train took about 8 minutes all told, and to give you some perspective, the subway takes an hour and a half, the bus an hour and 15 minutes. So, 8 minutes is a HUGE improvement!! 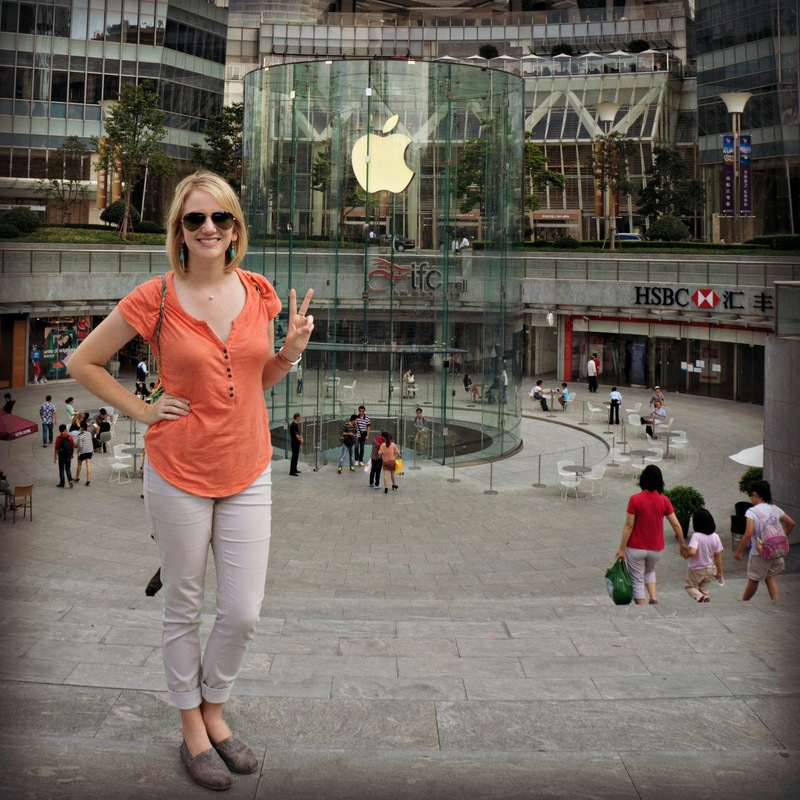 We then jumped on the subway from there and went in search of my first requested site to see: the iconic Shanghai APPLE STORE! Blueberry bunching happens in apple stores all over the world! Despite having done some fairly thorough research (or so I thought), we ended up going to two different WRONG locations before finally finding it. We walked around the area that the Oriental Pearl Tower is located, and the Apple Store is across the way from that. We were honestly pretty wiped out by then, but we knew we had more to see! I grabbed a bite to eat (my hunger was getting the better of me). Unfortunately, I think I’ve been getting some allergies because my throat has been killing me for a few days. So, I opted for some spicy and sour potato noodles with beef. They were a very different flavor than I’ve had before, but not bad! I ate most of it, and gave Romeo the rest. He was appreciative. 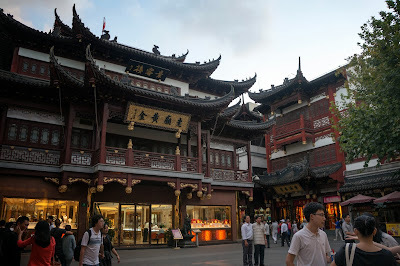 When we left that area, we headed for the Yu Yuan Gardens, another spot on our Shanghai list. Unfortunately, we were not aware that one of the subway stations (the one we needed to change at, of course), was closed due to some military parade (we think). Anyway, it took a couple back-and-forth rides to be sure, but eventually we found a roundabout way to get to the area we were headed for. We walked for what felt like forever through some pretty interesting buildings and TONS of people hawking their wares. Romeo and I both got a little snack - he had some candied fruits and I had cotton candy (which was way overpriced!). We were too late to get into the gardens, but the area was kind of Old Shanghai, and it was interesting! After a lot of walking, my feet were dragging. Although, I did get a souvenir I had been wanting: a jade ball. It is this single piece of jade that is intricately carved with layering balls within it. The guy originally said 180 CNY, but with the sneaky help of Romeo, we got it down to 50CNY! So, less than $10. ;) After that, we decided to go take a river cruise. 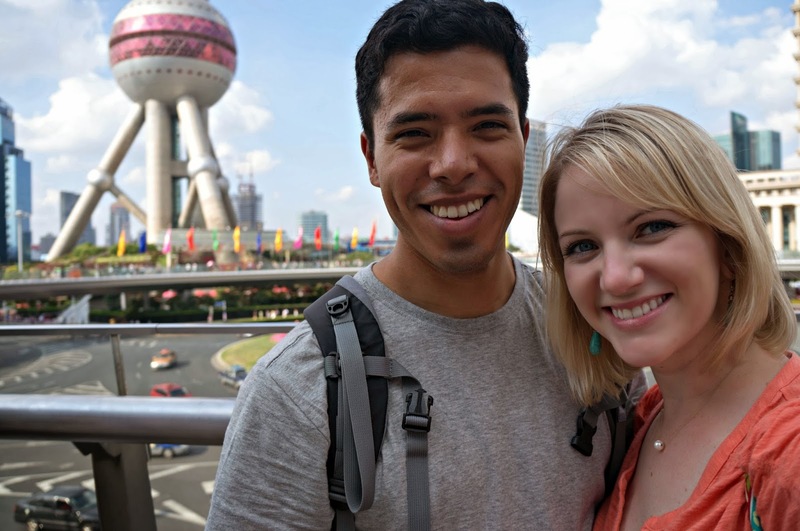 We had planned this (sort of), and it was the most expensive thing we did, but it was great (albeit a little short!) We got great views of the Bund as well as the crazy Shanghai skyline all lit-up at night. We rested for a bit, had a Chinese beer for a treat, and then headed up top for some photos! As you can see, it was gorgeous and bright! However, when we got off, it was time to head back to the airport. We took a long ride on the subway then caught our return trip on the Maglev train and ended up back at the airport at 9:08pm. Now, we are just waiting to go back through security and board our flight for Germany. It was an exhausting and full day. I can’t wait to brush my teeth (hopefully on the flight!) and have a shower (t-minus 17 hours til that can happen...). Erin is meeting us at the airport and I can’t wait to see her!!! Overall it has been an interesting and very enjoyable start to our journey. China has a lot of people, and a confusing subway system! Hey, you posted pictures! Yay!